Equipped in the Heavy weapon slot the Sleeper Simulat Fusion Rifle during gameplay feels more like a railgun. And its final exotic perk lets the fusion power shots bounce off of walls up to five times and rip apart enemies and players in the crucible. The weapon bares Rasputin’s (The war-mind of the Golden Age Known as AI-COM/RSPN) logo in front of the trigger which leads me to believe there will be a new class of weapons and armor produced with the theme of the ancient war-mind. We know that Crota and his army had an interest in shutting down or controlling Rasputin so maybe we will learn more about why. MIDKNIGHT EXIGENT: Status=still in progress. 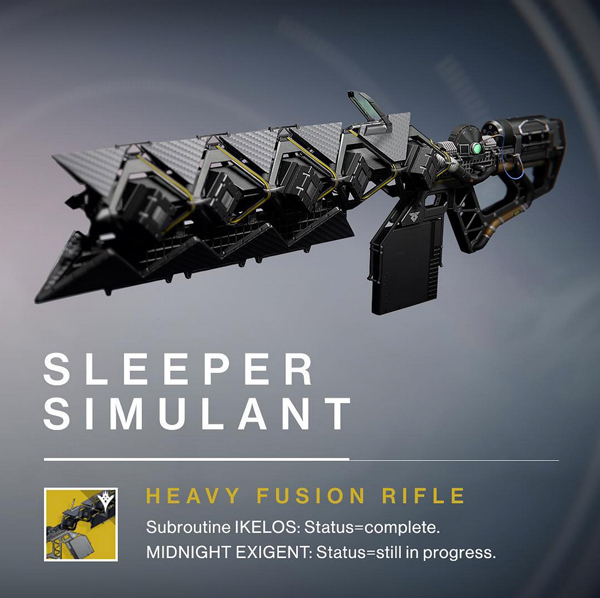 How to get the Sleeper Simulant? 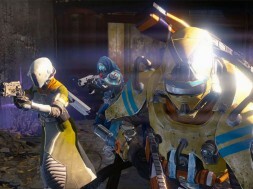 There will be a quest to search for relics of the golden age that you will need a partner to help you with. 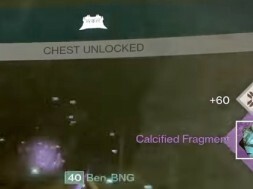 This quest when completed gives the gunsmith the ability to put the golden age relics together to give you the Sleeper Simulant as a reward. Who knows Maybe in Destiny Taken King we will also have some Bounties from Rasputin as well. I don’t know what it is about Bungie betting so hard on richocheting rounds. 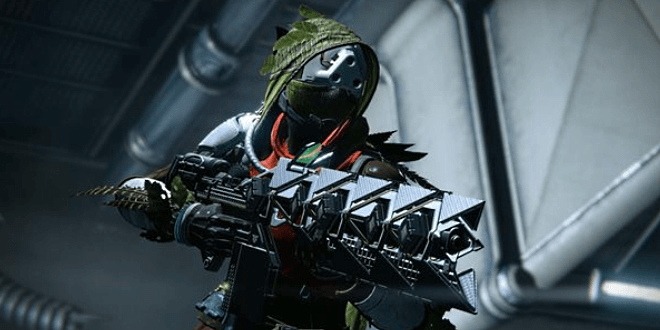 Hard Light, Dreg’s Promise, and now the Sleeper Simulant, and not one Guardian in Destiny would pick ricochet over something else. I’m hoping the precision damage multiplier is huge, to make this a high-risk/high-reward choice for when you need to deal unparalleled, massive damage to a single target. If I can create the same effect with two precision Sniper shots, than the Sleeper Simulant will be a failure. Over-penetration might pair well in extremely closed-off areas, assuming The Taken King adds some. Linear Compensator – Bonus to Range, straighter recoil, bonus to Impact. Reduced Stability. Accurized Ballistics – Bonus to Range, bonus to Impact. Better Target Acquisition. Reduced Stability. Best option: Accurized Ballistics/Linear Compensator. Stability won’t be an issue with something with such a huge charge time, so CQB Ballistics is pointless. 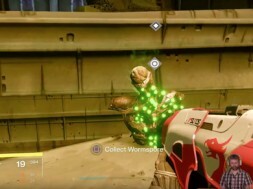 Any extra damage may be significant, and while I’m hoping this Exotic won’t even have damage drop-off, extra Range may help you hit those precision shots or widen the hit-box. Because the projectile has a travel time, extra Target Acquisition won’t improve hit-scan accuracy. Just a Scratch – Reduces aim deflection on incoming rounds while you’re aiming with the weapon. Helps the wielder stay on target during the long charge up. “Unflinching” for the enterprising Exotic on the go. Let’s hope its effect is more noticeable than Unflinching. It seems like a practical and smart choice, even if a little underwhelming in Exotic flavor. You want to hit your targets, and you may be under fire. The Taken are an aggressive bunch, and if your reticle is jerking all over the place, you won’t have much luck aiming this bad boy. Single Point Sling – Ready the weapon faster, and faster move speed while aiming. Best option: Speed Reload/Single Point Sling. Again, I don’t know why Perfect Balance is even on there. Who needs Stability when you have time to grab a cup of coffee in between shots? Speed Reload will be ideal if you want to keep firing uninterrupted, especially if you’re aiming for pure DPS and have a Synth on standby. Single Point Sling is also okay, if only to ready it immediately and for its synergy with Just a Scratch in helping you stay mobile, avoid damage, and hit your target reliably. [Final name TBD] – Increases bounce count of projectile to 5.
previous When does the new iphone 7 come out? 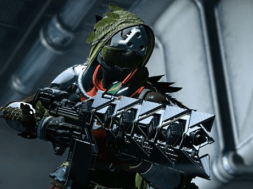 next Destiny The Taken King Exotics Revealed!